Located 45 minutes from downtown Montreal, Days Inn Berthierville is the perfect place to discover two of the greatest legends of Quebec: Gilles Villeneuve and Guy Lafleur. Take a nice walk on the island of St-Ignace, Berthierville or at the marina. We are convinced that your pet will love it as much as you. The Best Western Hotel Universel is located halfway between Quebec and Montreal, right off Highway 20, an ideal location for travelers. We offer personalized services, competitive rates, an indoor pool and Jacuzzi, and spacious, inviting rooms and suites. Are you ready for a life-time experience? Then a visit to Drummondville, Quebec is a must! This is the hometown of QUALITY SUITES DRUMMONDVILLE. The professional and friendly staff of the completely smoke-free hotel, located in the centre of Quebec, will make your stay unforgettable. Whether your purpose is business or leisure, you will be charmed by our 71 suites, all equipped with a kitchenette, fridge and free wireless high speed internet, offered for a competitive rate. Our dynamic and courteous team is ready to welcome you. Pets: - A pet fee of $25 per stay will be charged per room. - Owners are responsible for any damages caused by their pet(s). - No pets are allowed in public areas such as the pool or the breakfast room except for guide dogs. - Pets must be kept on a leash at all times while outside of the room, anywhere on the property. - No pets are to be left unattended at any time. The Hotel will take the necessary steps required, to alleviate any disagreeable pets left alone (i.e. barking or howling dogs, etc). - Housekeeping reserves the right to refuse service to the room if they feel threatened by a pet. - Owners are responsible for cleaning up after their pets, inside and outside. - On arrival, each pet is provided with a pet bed and bowls that are the property of the Hotel. If you want to purchase anyone of these items, advise us. We also offer your pets special complimentary treats. Located in the beautiful Centre-du-Quebec region, Drummondville's 4-star Le Dauphin Hotel & Suites offers a multitude of superior quality professional services, a token of success. In the most cordial of surroundings, come take advantage of our numerous packages (corporate, cultural, family or romantic). It is the location par excellence for holding your meetings and seminars in our rooms which can accommodate from 5 to 500 people. Pets: Pets are allowed in all of the hotel's guest rooms. There is an extra charge of $15.00 per night. Pets cannot be left in the room alone and must be leashed at all times when on hotel property. Because we understand that pets are part of the family, we are more than happy to welcome your furry loved ones in our NEWLY RENOVATED hotel. Around the hotel, you will find enough space for your dog to exercise. Also, we do appreciate pet owners who pick up after their dogs. Situated halfway between Montreal and Quebec City, Comfort Inn Drummondville is minutes from restaurants, shopping, and location attractions. Guests of Comfort Inn can enjoy a number of amenities, including free local calls, newspaper, coffee, FREE HOT BREAKFAST & WiFi internet access. Pets: $25.00 per stay (maximum of 1 pet per room). Pets are not to be left alone in rooms. No dogs in inside halls or breakfast area. Owners must clean up after their pets (outside & in). The Levis Quality Inn Hotel & Suites is conveniently located at the Levis Centre-Ville Autoroute 20 exit, less than 15 minutes from downtown Quebec City. Access to downtown is even faster if you cross on foot or by car on the Levis-Quebec ferry. The professional & friendly staff of our smoke-free hotel will make your stay unforgettable. Families & couple enjoy the the spacious rooms & suites, the heated indoor pool, the gym, the free breakfast and the walking proximity to nearby restaurants. 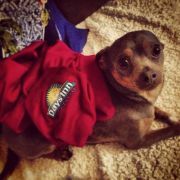 The Quality Inn & Suites Levis invite you and your pets! Pets: To ensure all guest satisfaction, the following policies were implemented: - A non-refundable pet fee of $25 + taxes per stay. - A valid credit card number is required. - Pet must out of the room for housekeeping or maintenance. - Pets should never be left alone in the room at any time. - Pets are not allowed in the breakfast area (except for guide or assistance dog). - Maximum 2 pets/room, cats and dogs only. - Pets must be leashed. - Pets are not allowed in the elevators, guests will have to use the stairs when with their pets (except for guide or assistance dog). - Pet owners are responsible to clean after their pets. - Pet owners are responsible for any damages caused by their pet. - The room could be subject to inspection at any time during the stay and/or at departure. - Noise or behavior complaints: If the hotel receives a complaint related to a pet and the management is forced to compensate other guests, the amount will be billed to the pet's owner. - The initial fee will not be refunded once the guest has taken possession of the room accompanied by the pet. - Non-compliance of this policy will incur a fine of $75 plus applicable taxes. For more information about our pets policy, please contact the Quality Inn & Suites Levis. Are you looking to stay in the enchanting setting of downtown Quebec City? Our charming inn, nestled in the heart of the historic district of St. Jean-Baptiste, is the ideal location for your visit. We are located near the door St. Jean (access door to old Quebec), the Plains of Abraham, the Avenue Cartier, the district of St. Roch, and more. Visit our French/English library and sip a cup of tea from our fine selection. We also offer free Wi-Fi. Our recently remodeled rooftop terrace offers breathtaking panoramic views. You will not find a stuffy hotel here. We want you to feel at home; your comfort and relaxation is our "raison d'être". And remember that a fine Quebec morning begins with a delicious homemade breakfast - our dining room will prepare a scrumptious full breakfast for you. Pets: Extra fees: $12.00 per day, per pet. Cats and dogs are allowed (pets must not be aggressive). Pets must not be alone in the room for housekeeping services to be provided. Pets are not allowed in the dining room. Enjoy the best of Quebec City from our hotel! The Delta Hotels Quebec welcomes you here to one of Canada's most beautiful cities with contemporary sophistication, helpful amenities, a prime downtown location and its pet-friendly program. Our hotel is a short walk from the heart of Quebec City's Old Town district, near the Gare du Palais and an array of famous attractions. Chateau Frontenac and the Plains of Abraham are just a short distance away. 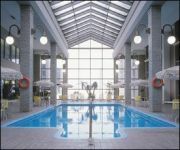 Located in the center of Quebec city, 3-star Le Dauphin Hotel & Suites offers a multitude of superior quality professional services and an indoor pool. In the most cordial of surroundings, come take advantage of our numerous packages. It is the location par excellence for visiting the Old Quebec city and the Galerie de la Capitale shopping center. The Comfort Inn Airport East is conveniently located three kilometres from Jean Lesage International Airport (YQB). Whether your travels are for business or pleasure, the Comfort Inn Airport East is the best place to stay because we can fulfill all your needs. We provide friendly customer service, gracious accommodations and affordable rates. Completely renovated in 2016, Hotel Champlain offers an original lodging alternative, more than ever! Near Chateau Frontenac, Grande Allee, the Old Port and the Parliament, Hotel Champlain allows you to walk to every attraction of interest in the old city and in downtown Quebec. Discover a decor where each room offers a design that is a marriage of classicism and eclecticism, a perfect blend of the romantic atmosphere of historic Old Quebec and the modern touch that you're looking for. Pets: The guest agrees to never leave the dog alone and to keep it under control in public areas. The guest agrees to pay any additional fees if the dog goes in other guest rooms ($100) and for damages. The guest must schedule room cleaning in advance between 09:00AM through 01:00PM.